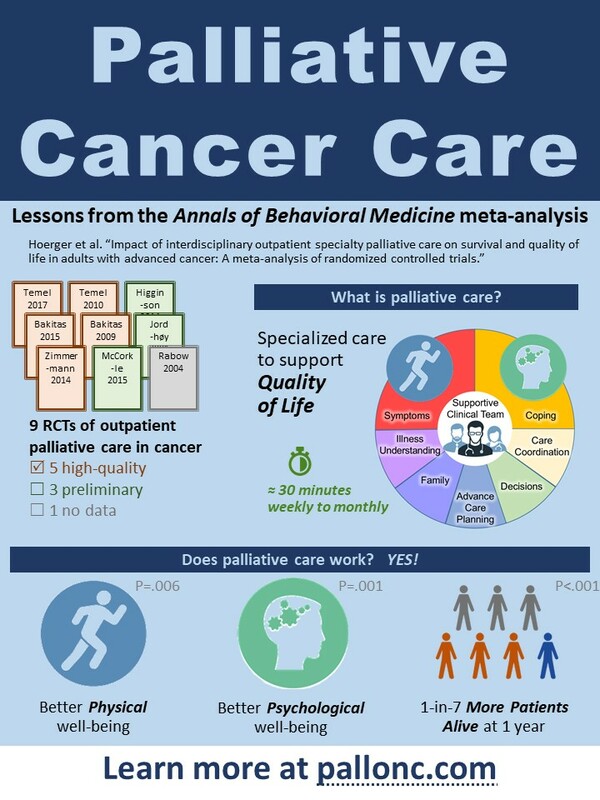 Welcome to the dissemination center for the palliative cancer care meta-analysis (Hoerger et al., 2019, ABM). We thank Oxford Academic for providing our website with a free full-text link. Check out this PowerPoint (PPT) presentation with slides, graphics, and memes summarizing and expanding on the key findings. The ZIP/JPG version may be most useful if you just want image files for each slide to share via social media. For easy access, we have also included some of the more popular images below. This colorful flyer (JPG) may be useful for posting in shared spaces or via social media. It lists the studies reviewed and analyzed, provides a basic definition of palliative care, describes the key elements of palliative care, and summarizes three of the key findings. It is designed to be useful for a variety of audiences, including patients, families, clinicians, scientists, and policymakers. This one-sheet (PDF) is designed to be shared with colleagues who may lack familiarity with palliative care and meta-analysis. It provides basic definitions of "palliative care" and "meta-analysis," summarizes the key findings, and describes implications for patients, families, and clinicians. The study has been tweeted >400 times and gained more attention than 99% of recent scientific articles. You are welcome to share any and all content on social media. There is no need to contact Dr. Hoerger for permission. Hoerger, M., Wayser, G. R., Schwing, G., Suzuki, A., & Perry, L. M. (2019). Impact of interdisciplinary outpatient specialty palliative care on survival and quality of life in adults with advanced cancer: A meta-analysis of randomized controlled trials. Annals of Behavioral Medicine. Background. In advanced cancer, patients want to know how their care options may affect survival and quality of life, but the impact of outpatient specialty palliative care on these outcomes in cancer is uncertain. Purpose. To estimate the impact of outpatient specialty palliative care programs on survival and quality of life in adults with advanced cancer. Methods. Following PRISMA guidelines, we conducted a systematic review and meta-analysis of randomized controlled trials comparing outpatient specialty palliative care with usual care in adults with advanced cancer. Primary outcomes were 1 year survival and quality of life. Analyses were stratified to compare preliminary studies against higher-quality studies. Secondary outcomes were survival at other endpoints and physical and psychological quality-of-life measures. Results. From 2,307 records, we identified nine studies for review, including five high-quality studies. In the three high-quality studies with long-term survival data (n = 646), patients randomized to outpatient specialty palliative care had a 14% absolute increase in 1 year survival relative to controls (56% vs. 42%, p < .001). The survival advantage was also observed at 6, 9, 15, and 18 months, and median survival was 4.56 months longer (14.55 vs. 9.99 months). In the five high-quality studies with quality-of-life data (n = 1,398), outpatient specialty palliative care improved quality-of-life relative to controls (g = .18, p < .001), including for physical and psychological measures. Conclusions. Patients with advanced cancer randomized to receive outpatient specialty palliative care lived longer and had better quality of life. Findings have implications for improving care in advanced cancer.